Home All Universities Post UTME Updates 2018/2019 BIDA POLY Degree Programme Form is Out. Courses, Requirements, Cut Off Mark and Price. 2018/2019 BIDA POLY Degree Programme Form is Out. Courses, Requirements, Cut Off Mark and Price. 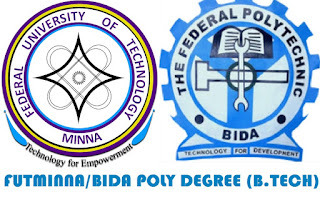 In case you're reading this for the first time, Federal Polytechnic Bida in Niger State (BIDA POLY) has affiliated with the Federal University of Technology Minna in Niger State (FUTMINNA) to run degree programmes for all interested UTME and DE applicants. This is a new relationship between the two institutions to run degree courses on the polytechnic's campus for certain courses as discussed below. This programme is the same as the one on the FUTMINNA's main campus. No difference! And it's the university that gives you a certificate after completion of your course and mobilizes you for NYSC. You don't need to choose the university degree in UTME. Just obtain their form on the polytechnic's portal. And leave the rest to the management to handle for you. See also: OFFA POLY Degree Programme Form is Out. See Courses, Requirements, Cut Off Mark and Price. Applications are hereby invited from interested and suitably qualified candidates for admission into the following B.Tech Degree Programmes of the Federal University of Technology, Minna in affiliation with Federal Polytechnic, Bida 2018/2019 academic session. English Language, Mathematics, Physics and any two from Chemistry, Geography, Economics, Fine Art, Technical drawing, Building Construction and Biology. English Language, Mathematics, Physics, Chemistry and any other science subjects. English Language, Mathematics, Physics and any two from Chemistry, Economics, Biology, Accounting, Business Method, Geography and Technical drawing. Candidates must in addition to SSCE qualification in above have LOWER CREDIT at National Diploma (ND) or MERIT at NCE level. Candidate with IJMB must score a minimum of FIVE (5) POINTS or FOUR (4) POINTS (CPES, FUT, Minna) and pass at least two (2) subjects relevant to their proposed courses. Candidate must in addition to SSCE qualification in above have LOWER CREDIT at Higher National Diploma (HND) level in their proposed courses. Only O’Level results print-out downloaded from the website of the National Examination Bodies (WAEC/NECO/NABTEB) of Photocopies of Original Certificate(s) will be accepted for verification. Ready to apply? Visit Federal Poly Bida FUTMINNA (Degree) Application page.